Explicyte set up and validated a robust real-time neutrophil migration assay, which allows for time-lapse monitoring and analysis of chemotactic driven neutrophil migration across an optically clear filter membrane. This kinetic assay is well suited for the evaluation of candidate compounds’ ability to inhibit neutrophil migration towards chemoattraction. Human neutrophil chemotaxis toward fMLP, IL8 and CXCL1. Freshly isolated human neutrophils are plated on a coated optically clear filter membrane (top side), and then exposed, unless otherwise indicated, to fMLP (A), IL8 (D) and CXCL1 (G) or in the presence and absence of a phopsholipase C inhibitor U73122 (B, C) or a CXCR2 antagonist AZD10397767 (E, F and H, I). Cell migration is then monitored by real-time imaging and analysis is performed over a 6h (fMLP, IL8) and 15h (CXCL1) period monitoring. 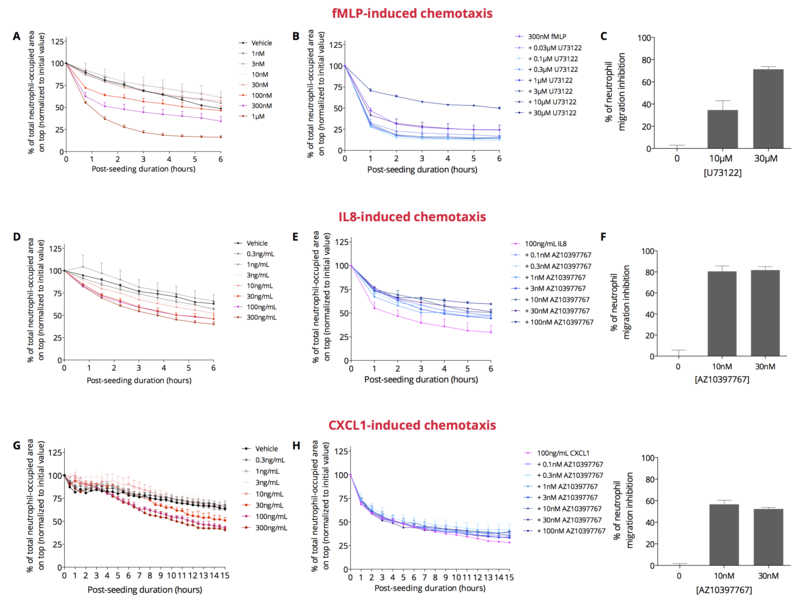 Chemotactic neutrophil migration is dose-dependently induced byfMLP (A), IL8 (D) and CXCL1 (G), rapidly over a period of 6h (fMLP, IL8) or 15h (CXCL1). The CXCR2 antagonist AZD10397767 partially abolishes these IL8- (E, F) and CXCL1-induced (H, I) chemotactic effects – while the phospholipase C inhibitor U73122 partially abolishes the fMLP-induced chemotactic effects (B, C). To learn more about our Chemotaxis assay, visit our dedicated webpage.